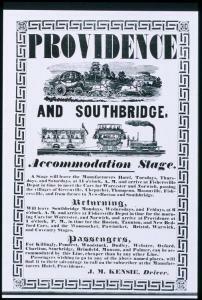 PROVIDENCE AND SOUTHBRIDGE, Accommodation Stage. A Stage will leave the Manufacturers Hotel, Tuesdays, Thursdays, and Saturdays, at 11 o’clock, A.M. and arrive at Fishersville Depot in time to meet the Cars for Worcester and Norwich, passing the villages of Greenville, Chepachet, Thompson, Masonville, Fishersville, and from thence to New-Boston and Southbridge. Returning, Will leave Southbridge Mondays, Wednesdays, and Fridays, at 6 o’clock, A.M. and arrive at Fishersville Depot in time for the morning Cars for Worcester, and Norwich, and arrive at Providence at 1 o’clock, P.M., in time for the Boston, Taunton, and New Bedford Cars, and the Woonsocket, Pawtucket, Bristol, Warwick, and Coventry Stages. Passengers, For Killingly, Pomfret, Woodstock, Dudley, Webster, Oxford, Charlton, Sturbridge, Brimfield, Munson, and Palmer, can be accommodated by this Line, cheaper than by any other Line. Passengers wishing to go to any of the above named places, will find it to their advantage to call on the subscriber at the Manufacturers Hotel, Providence.